Exciting news from the Courtenay and District Museum and Palaeontology Centre! Their elasmosaur, which was discovered in Courtenay, has been shortlisted in a competition to become an official provincial symbol. Click to Here Vote. The voting period will close November 23, 2018. “Exploring Pebbles, Rocks, and the Stories they Tell” with Eileen Van der Flier-Keller. “A Journey Back in Time with the Fabulous Fossils of Hornby Island” with Dan Bowen and Betty Franklin. “A Walk in Helliwell Park to See, Hear, and Appreciate Birds” with Art Martell. “Canada’s Glass Sponge Reefs” with Stephanie Archer. 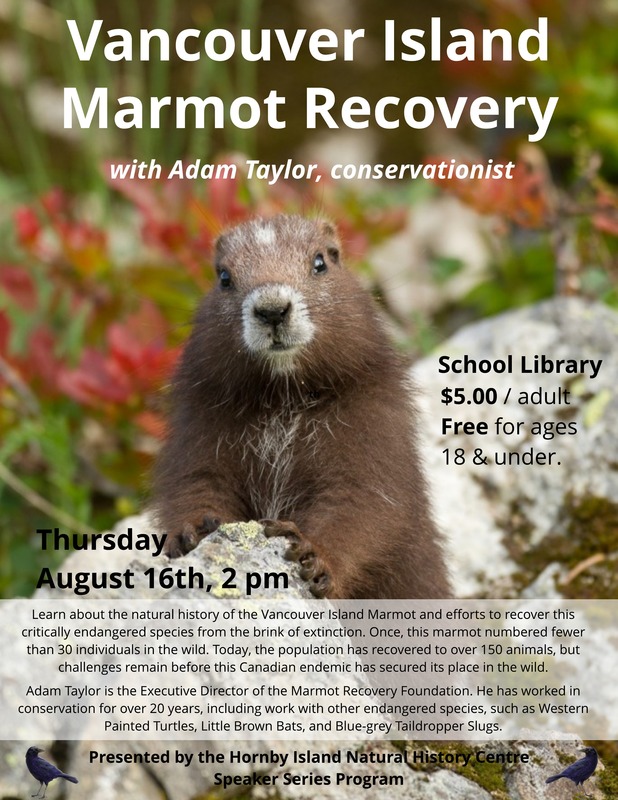 “Vancouver Island Marmot Recovery” with Adam Taylor. Check out this cool footage from Dr. Archer’s presentation of a young glass sponge reef taken just east of Hornby Island! Thank you to the speakers and nature walk leaders for sharing their knowledge and supporting the Natural History Centre: Stephanie Archer, Dan Bowen, John Cox, Betty Franklin, Art Martell, Jessica Shultz, Adam Taylor, Eileen Van der Flier-Keller, and Kihan Yoon-Henderson. And thanks to everyone who came out and participated in the nature talks and activities! As many of you have heard, there was a fire at the Hornby Island Community School early Sunday morning. The fire department and janitor were called by the school’s automatic alarm system at 3 am. Firefighters from Hornby and Denman worked through the night to put out the fire. A third of the building was burnt and the rest was damaged by smoke and water. There was no water damage to the collection. The collection has smoke and soot damage and we are beginning a restoration and maintenance project. We will do everything we can to maintain and continue making it available to the public in the future. We are very grateful to the Hornby Fire Department and Denman Fire Department who worked for hours to contain and put out the fire. Thank you to the community for your support and the offers of help. Our thoughts are with the staff and students of the school who are deeply affected by this tragedy. We will keep people posted on the details once we know our next steps. Hornby Water Stewardship is looking for volunteers from across all parts of Hornby to take part in a groundwater research project to be conducted by Dr. John Cox (Kirk Road, Hornby and Mount Royal University, Calgary). Samples will be collected during the period September 11-19, 2018. One sample of water (less than a litre) will be needed from each well for analysis. This research is a follow on to research done in the past. As such, it will provide data for comparison of water quality over time. Areas of Hornby may be identified in the project report, not individual well results. Please contact either of the following people if you are interested in donating a water sample for the project. We will meet at the head of the trail at 10:25 am, right next to the parking lot. This walk is part of the Nature Field Trip Series. Admission is $10.00 per person. Youth 18 and under attend for free. Pre-registration is eseential as space is limited to 12 participants. For inquiries or to register, please email hornby.naturalhistory@gmail.com, call 250-335-1021 during NHC’s open hours, or come to the Centre. Thursday, August 9th, with Jessica Shultz, marine biologist. Both the Summer Nature Walks with Art Martell are now full. We will meet at the head of the trail at 7:55 am, right next to the parking lot. The walk will be about 3 km and take about 2 hours. We will listen to and identify bird songs and try to see any birds that might cooperate. Art will provide information on local birds and answer questions. Bring binoculars if you have them. No dogs please. Please note, this walk will be cancelled if it rains. Space is limited to 10 participants. This walk is part of the Nature Field Trip Series. Admission is $10.00 per person. Youth 18 and under attend for free. Pre-registration is essential as space is limited. For inquiries or to register, email hornby.naturalhistory@gmail.com. After Tuesday, July 13th, email hornby.naturalhistory@gmail.com, call 250-335-1021, or come to the Centre. This walk is now full. Click here for the full Summer 2018 Nature Field Trip Series.